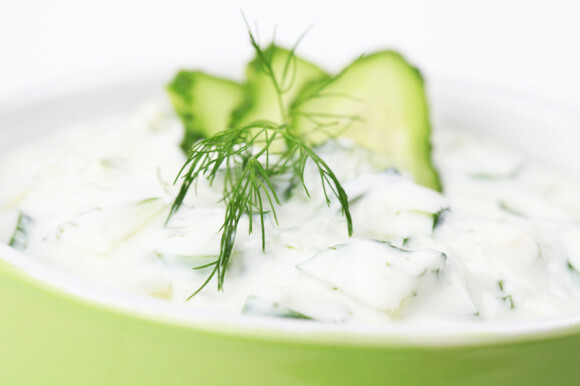 This wonderful Greek cucumber sauce is a versatile topping that can be used in appetizers, salads, main dishes, and more. Traditionally, it is used in Greek Gyro sandwiches, as a topping similar to what you would do with mayonnaise in an American sandwich. It’s wonderful on top of beef, chicken, or lamb kebabs, on top of greek rice, on top of salads and also sandwiches. This sauce is easy to make, very, very delicious, and will stay in the refrigerator for about a week. Add all ingredients in a glass bowl or similar. Still contents until smooth. Add salt and pepper to taste. Cover and chill for 20 minutes or longer. Serve on top of your favorite dish.